What questions could possibly be asked of a team that went undefeated on the road to a Spring Season title? Already clinching a berth in the Championship Playoff format, the Cosmos enter the fall season with all the confidence in the world, but some uncertainties regarding health and goal scoring remain. Jimmy Maurer had a .90 GAA in the Spring Season which put him in second place overall behind Ottawa’s Romuald Peiser. Jimmy is going to be the number one keeper for this team and will continue to perform well, but he does have a history of some mistakes, such as leaving his line prematurely. The potential also exists for Maurer to get a few games off, granting some opportunities for Keasel Broome or fan favorite Kyle Zobeck to play. The Cosmos back line was pretty consistent in the spring season giving up only 9 goals. However, health became an issue towards the end as often injured center back Roversio found himself missing time again. Without Roversio, the Cosmos are missing a general in the back line but the other center back, Carlos Mendes, has enjoyed a very solid year so far. Samuel Caceres, their backup, but has not been overly convincing. At the fullback positions, Ayoze is the mainstay out left. This season, the right back spot was mostly Hunter Gorskie’s to lose. However, the return to health of Hunter Freeman has seen him get some time at RB during the Cup run. Gorskie has flexibility and can slot into the CB position if needed but he is not as strong in that role. Gorskie is a younger player who makes very solid overlapping runs creating some space for service into the 18. Freeman’s service leaves much to be desired so expect Gorskie to hold down the RB spot for the time being, unless he is needed in the CB role because of injury. 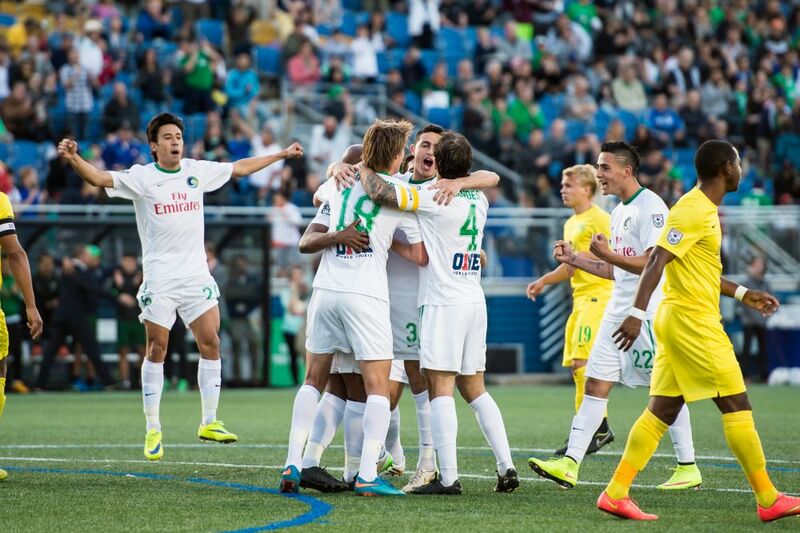 There is no question that the midfield has been the strength of the 2015 New York Cosmos side. They have a plethora of depth and quality in the midfield and it is highlighted by new addition Raul. However, the surprise of the spring season has not been the Real Madrid legend but instead the play out wide of both Walter Restrepo and Leo Fernandes. These players both came onto the scene and shocked Cosmos fans with pace and ability to create from the wings. At times, these players have even switched fields to cause fits for opposing back lines. The play of Restrepo and Fernandes has pushed the El Salvadorian national team captain Andres Flores to the bench. At times, Flores has come on to help push things when the team is struggling, but the quality is certainly there. Sebastian Guenzatti is another option in the attacking midfield but his play in the spring season has not been as strong as in the past. The Cosmos usually play a 4-2-3-1 with the holding roles usually occupied by Marcos Senna and Danny Szetela, however the former has not been entirely healthy since pulling a hamstring against Carolina on May 16th. With Senna out, we have seen Ex-Houston Dynamo player Adam Moffat fill in alongside Szetela, but without the same chemistry that the Spaniard’s presence provided. Moffat does, however, offer a long distance shot that is tough to defend. As good as the midfield has been for the Cosmos, the forward position has been a real concern for most fans. Consider that of the 18 goals the Cosmos scored in the Spring Season, only 3 were scored by strikers. The Cosmos rolled out in the spring with Mads Stokkelien filling that role but after three games of no productivity, he was replaced by ex-Tampa Bay Rowdie Lucky Mkosana. Lucky immediately brought a different dimension into the XI with additional pace and gave defenders fits with his good off the ball runs. As he continued to get starts, the midfield’s faith in Lucky grew and he started seeing constant service. While Lucky has excited the fanbase, the Cosmos need more in terms of finishing from their forwards and they might have been looking internationally to fill that void. There are a few storylines to watch for the New York Cosmos as they go into the fall season with a playoff spot already confirmed. With some aging stars, you could see Gio Savarese go to his youth to help manage health as the fall season does include some mid-week games. Expect to see United States U-18 prospect Haji Wright get his fair share of minutes in the fall as he continues to progress his career to an eventual move overseas. Some other Cosmos B players who can see some time are Ruben Bover and Julian Stahler. The big battle though, will be in the standings as the Cosmos were only able to win the Spring Season by one point over the Rowdies. The battle for the first seed will be as intense as ever, possibly coming to a climax against Tampa Bay on October 31st at Shuart Stadium.